There is no question whether you need a durable garage floor or not. It’s one area in your home where there is constant pressure created not only by you but your cars too. You don’t want to waste your time constantly repairing or repainting your floors. One quick and effective solution to make it durable is with epoxy paint. Epoxy has a high reputation for making your garage floor resistant to stains, peeling, and wear and tear. 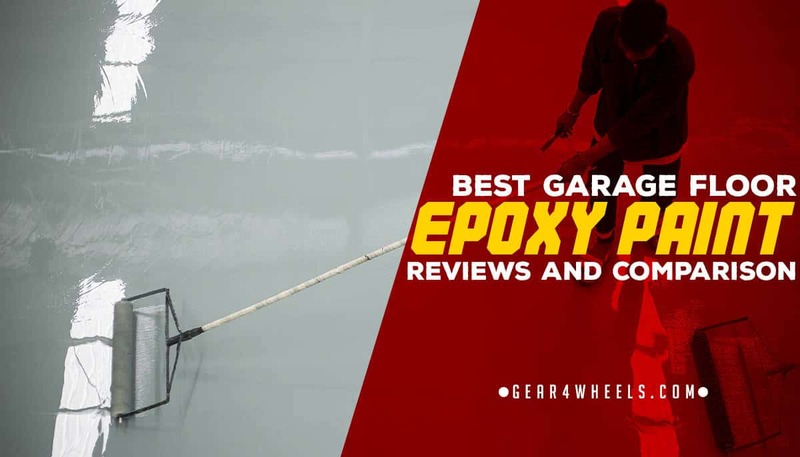 Compare these five best garage floor epoxy paints and be the judge on which one is best for you. This is a durable epoxy paint from the specialist company Rust-Oleum. It was picked because it has proven countless times to be tough on stains and wear & tear. One main advantage of this epoxy paint is the super adhesion on the floor’s surface. The epoxy will have a strong bond on the garage floor’s surface which then contributes to the secondary durability advantage. The epoxy makes your floor resistant to stains such as chemicals, antifreeze, grease and oils. It also resists hot tire pick up which leads to cracking and peeling. The kit arrives with a concrete etcher which you need to make the floor porous. This ensures a stronger bond hold. Compared to other brands Rust-Oleum instructions are easy to follow and make application simple & quick. Although the description says that the epoxy handles hot tires well it’s best you let them cool before you park your car in the garage. This scenario and areas where it’s extremely hot the epoxy doesn’t hold up to the heat which can cause it to peel. 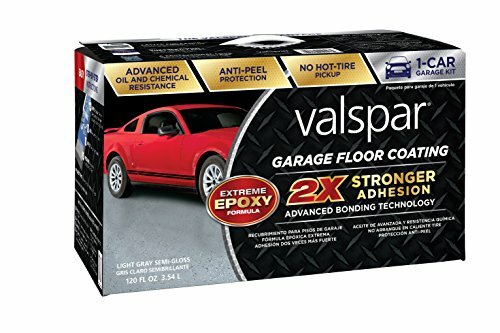 The advanced bonding technology makes this garage floor coating from the esteemed brand Valspar a great consideration. The stronger adhesion contributes to enhanced durability. The most important characteristic of the garage floor coating is the advanced bonding technology. This leads to double the adhesion other epoxy coatings have. You only need one coat to make the floor durable and resistant to most stains from oils and grease. The stronger bonding helps the epoxy not peel too easily due to hot tires. 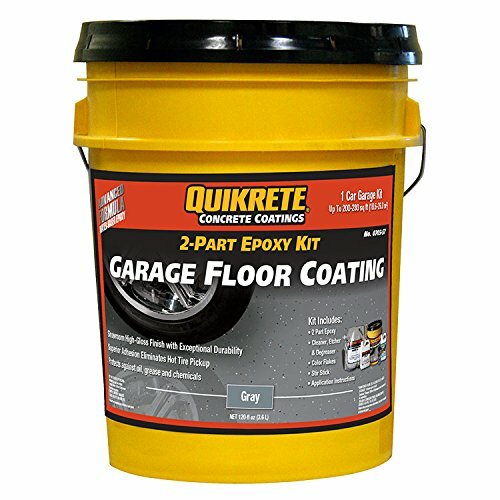 This epoxy protects your floors well from oil, chemical and grease stains when you use your garage as a workshop. The thick coat makes it easy for you to wash away stains. Your floors will always have that semi-gloss finish you’ll love years after the epoxy’s application. The mixture can get thick when the pot life exceeds the recommended time. Once the mixture thickens it’ll be difficult to apply it to the floors in a smooth and light motion. If you buy more than one product to cover larger areas there is a chance the new coating color won't match the previous. 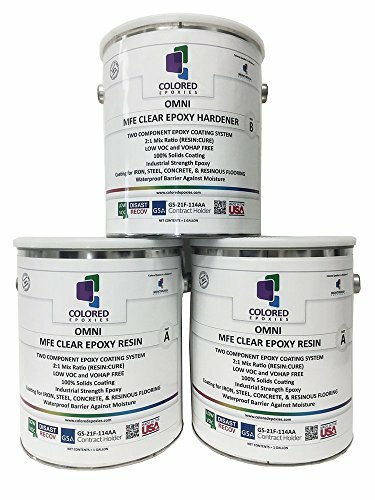 Coloredepoxies specializes in making clear garage epoxy resin guaranteed to give your garage floor the toughness it needs to withstand harsh conditions. The epoxy is highly flexible which makes it resistant to scratches and scuff marks. The coating is designed to be used on the floors of commercial, industrial and residential industries. It won't crack or peel from the constant pressure of vehicles and machinery. Liquid stains are easy to remove. The coating is 100% solid and is VOC & VOHAP free. The paint is odorless making it easier for you during application. This is a huge competitive advantage because at times other epoxy paints have strong smells that last for weeks. The three part mixture can be very watery which makes a thin layer. You need to reapply the mixture again to build a hard coat. This leads to a cost disadvantage because you need to buy more than one product to build the hard coat. 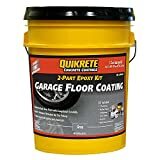 Quikrete Concrete helps you to maintain your garage floors with this top quality product. This epoxy paint makes your garage floor become durable and resistant to wear and tear. One competitive advantage of this epoxy paint is there is no resting period. After mixing the paint thoroughly you can apply the mixture immediately onto the floor. This significantly reduces the time needed to prepare and apply the paint. The mixture runs well which makes it easier for you to spread it across the room. The coating will stand the test of time as it won't peel when hot tires constantly drive over it. Even when you wash the floor with a scrub the harsh texture won't lift the epoxy from the cement. Your floor will always have a showroom shine to it. The coating is not completely resistant to harsh solvents which may be needed in a workshop. If you store these harsh solvents in your garage and they accidentally spill they can strip the coating completely. You can revamp your garage floor by using this reputable brand’s epoxy paint. Your garage floor will look new and modern. The decorative flakes that come with the kit give your garage floor a modern showroom appearance. The paint is odorless which ensures a more comfortable application. The kit comes with an etcher for your concrete floors to ensure a strong adhering. This in turn contributes to a floor coating which is durable against oils, salt, hot tire pick up and gasoline. You don’t need to prime the concrete floor before the epoxy application. The paint is effective by itself which is proved by its easy application and enhanced durability. Once dried your garage floor will shine. The coating makes the floor easy to clean without wearing out the glossy appearance. The floor needs to be thoroughly etched before you add the layer of epoxy. If not it doesn’t bond well to the floor which reduces the durability. Your floors may peel sooner than expected. 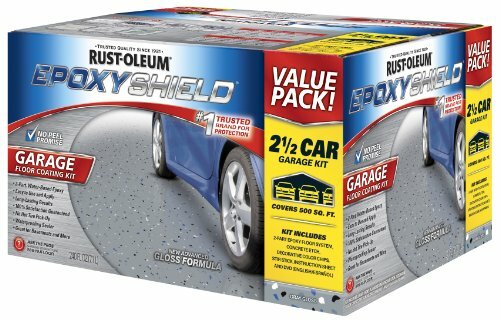 Choose the Rust-Oleum EpoxyShield if you want the best epoxy coating on your garage floor. It has a long lifespan even if you wash the floors regularly. It’s even resistant to stains and hot tire peeling. Your garage will now look as beautiful and maintained as the rest of your home. Great article! 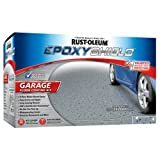 very informative and this is awesome suggestions for the garage floor epoxy paint.Thanks for the guideline. It’s very helpful.